Unfortunately the following Masjid has become the symbol of the Palestinian cause and many even mistaken it for the true Masjid Al-Aqsa’, although it is merely a Masjid built by the Umayyads (ironically the Rafidah usually walk around with that picture on their rallies). 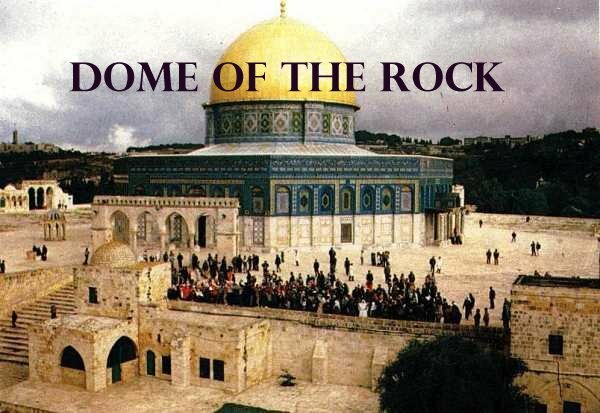 The Umayyad Khalifah, Abd’ al Malik ibn Marwan in 691/2 [72/73 AH] began the construction of, Dome of the Rock – today this is the Golden Domed Mosque. Where is Aqsa of Shias? Rafidite Iran wouldn’t give the Palestinians the husk of a datestone , except to convert them to Shi’ism or open a few Husseiniyya’s (Temples where Rafidah practice self-flagellation). Something which already happened in Ghaza and elsewhere. And in action we are all witness what ‘death to America and Israel’ etc. really means. It means nothing but death to Sunnis for Iran is busy causing trouble (and bloodshed) almost in every Sunni country possible from Egypt, Yemen, Bahrain, Lebanon to Iraq and of course Syria where the Safavid regime along with the party of Satan (Hezbush-Shaytan aka ‘Hezbollah’) are busy killing the Sunnis of Syria who simply don’t want to be ruled over by an Alawite-Bathist-secularist-Shi’ite. 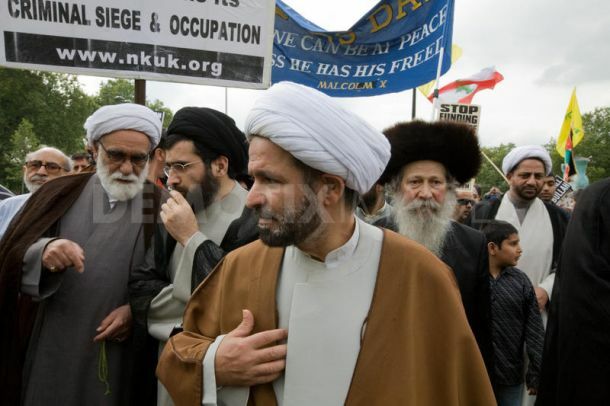 Those who attend these demonstrations inlcuding gullible Sunnis, marxists and other leftists do not even realise that the Iranian regime must divert attention from all the crimes it commits in Yemen, Syria, Lebanon etc. by organizing and attending these FAKE Anti-Israel/Anti-U.S. demonstrations. The average man on the streets likes slogans and the charlatans know that so they use it, so does Iran with her empty slogans. If we were to go by who shouts and raises his voice the loudest against America and Israel then surely we should take North Korea as our role model instead of Iran but since we are Muslims we are obliged judge everyone (group, government etc.) by his Aqidah (creed) not by political slogans. And remember, those who shout the loudest have the most to hide. Unless they attend these demo’s they will be exposed as traitors by the even the last gullible Muslim living on earth, after all , what else are they doing? They are dong nothing except burning flags and chanting empty slogans (even Saddam did more against Israel by firing – at least – some missiles on their soil, something Iran never did …) yet a few hundred demonstrators burning an israeli flag erases the deaths of one million muslims in Iraq (by the Americans who could never topple Baghdad except with the help of the Rafidi regime, in return America gave Iraq to Iran on a golden plate, it is literally run by Iranian stooges), thousands of Syrians who suffer at the hand of the Safavid-Majoosite alliance of Iran, the Bathists of Syria and the party of Satan (‘Hezbollah’). The sheer hypocrisy of these people is unbelievable, how dare they even raise the ugly pictures of dictators and Tawaghit such as Khomeini, Khamenei and the double-faced heretic Hassan Nasrallat and his Hezbollat?! Surely, the Syrians can be proud of their struggle against the Rafidi-Safavid-Bathist-Russian-Chinese allaince, for their struggle has achieved what took preachers and scholars decades (i.e. 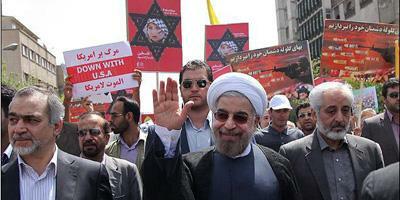 exposing Iran and the Rafidah). They have exposed the Rafidite world and the Iranian regime to the maximum even many Ikhwani groups have woken up and realised the true agenda of the Iranian regime. Before 2003, Sad­dam cre­ated “Al-Quds Army” to gain the Arab sup­port. Now it is the same sce­nario all over again, but this time the orders come from Tehran to deceive and fool the gullible ones, those who are impressed by hot air i.e. empty slogans and rethorics, no actions just deception, sheer hypocrisy. Who could put that hypocrisy better than a Palestinian scholar himself? Beyond the hatred, the racism and the anger, there’s a certain irony surrounding Al-Quds Day, commemorated this weekend internationally and to its shame — in Toronto. 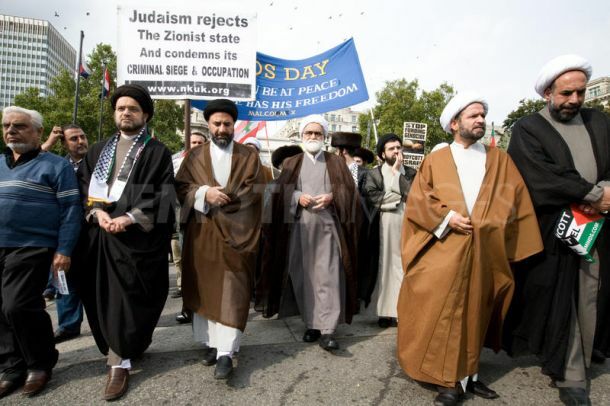 The event was founded by the Ayatollah Khomeini, and is an overwhelmingly Shiite Islam event. Anybody who knows Islam will understand that the Shiites are despised in most of the majority Sunni world. They were treated as second-class citizens in Lebanon, they are murdered in Pakistan, they are thought as being, golly, even worse than the Jews in Syria, and there aren’t any in Egypt because Saladin killed them all. So spare me the lies and propaganda about Islamic brotherhood and the fraternity of Muslim believers. You have not seen genuine hatred if you haven’t seen how Muslim sect treats Muslim sect. And you’ll see a lot more of it when President Assad falls, and his fellow Alawites, a version of Shiite Islam, are likely slaughtered like cattle. They couldn’t give a damn about the Palestinians, and see their plight as another way to extend their own ideology. Good Lord, some of them even pretend to be Iranian when they’re not. I interviewed one of the Al-Quds Day organizers some years ago, and knew him to be Pakistani. He lied to my face, because being Iranian is apparently way sexier in the Islamic fanatic community. There may well also be Hezbollah flags flown. This internationally recognized terrorist group is illegal in Canada and is also playing a central role in the Syrian massacres that we read about every day. Imagine, for example, a large group of people waving Paul Bernardo flags, or Nazi banners. Lastly, what’s taken taken by force can only be return by force not by rallies with empty rethorics. May Allah free Palestina from the Jews and help the Ummah get rid of the enemy who is worse than a million Zionist Jews put together, the Rafidite Safavids. 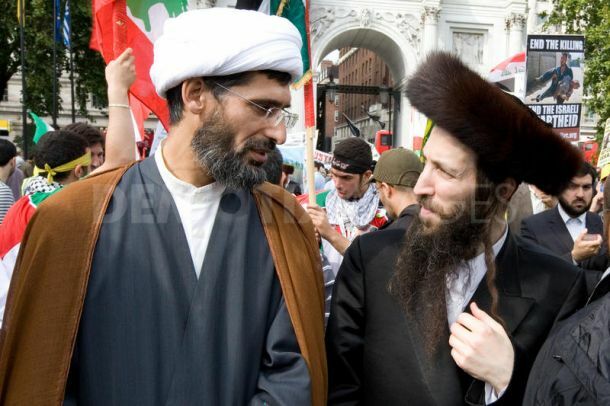 Look at the Rafidah Rabbis (“Shia scholars”) and the Jewish Rabbis standing together in one row! 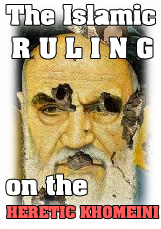 This entry was posted in Khomeini the Heretic, The Neo-Safavid State. Bookmark the permalink.